One day, several weeks ago D wondered why I don't have a hobby. He was surprised to learn that my hobby is my work—my work is my hobby. I know... I'm lucky. I hope that many of you feel the same about what you do every day. There is nothing more rewarding than ending the day with satisfaction about your work and relief that ideas that you've had have come to life. As rosy as that all sounds it also is best to get away every now and then. That's what I did over the weekend. I went to San Antonio (3 hrs from here) for a couple of days to visit friends—all alone. I came back recharged, albeit a bit derailed and off track with my to-do list. But it was well worth it. 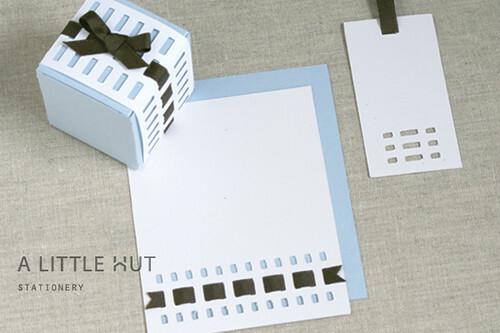 Seeing these new stationery sets makes me feel like I'm getting me back on track. They were a lot of fun to make. 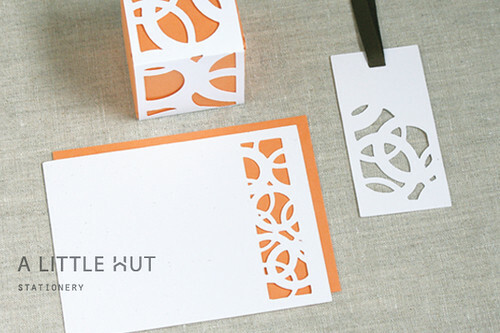 The Entwine and Motion stationery or party sets (for digital cutters) include a flat card (for notes or invites), a gift tag (or bookmark), a favor box with a matching wrap band and an envelope. The Entwine set can be used as is or ribbon can be added for an extra touch. Other projects: the reading is going well. The scrapbooking—well, I'm a bit behind—already. And tomorrow I'll have some great news to share!